Deep in Fuglefjord („Bird bay“), there is Svitjodbreen, a quite impressive glacier with many crevasses and a mighty calving cliff that is often quite active, as indicated by the many bergy bits, growlers and smaller icebergs that are often drifting there. 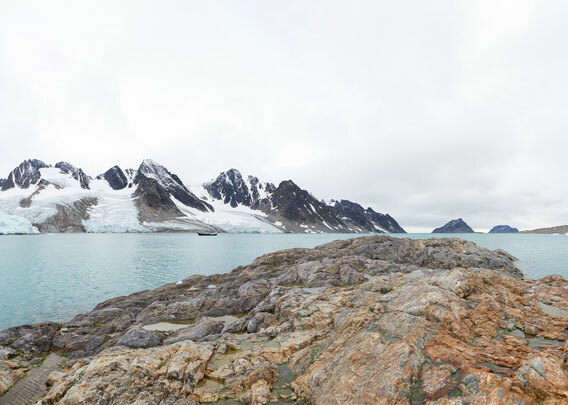 The glacier is retreating strongly: near to its front, there is a small rocky island which did not exist 10 years ago (time of writing: 2015), but it was covered by the glacier. Initially, rocks became visible at the lower edge of the ice cliffs some years ago, becoming bigger and bigger over time until they were isolated from the glacier and completely surrounded with water. Then, they were still covered with isolated towers of glacier ice, which melted and disappeared over a few years, so I could venture for a short landing on this small, unnamed island. 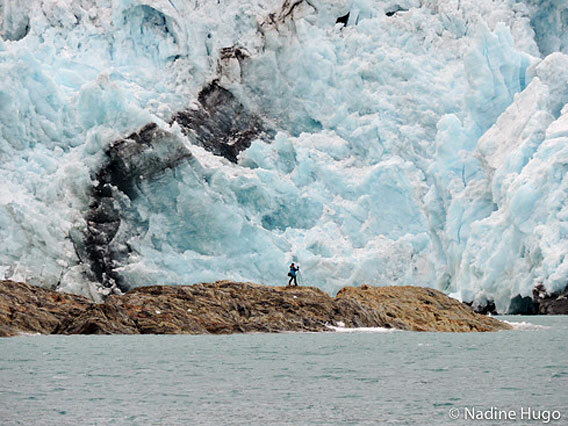 The distance from the island to the glacier was several hundred metres, so there was no risk with the boat nearby. But it looked quite dramatic from the ship, as the photo below taken by Nadine shows. If anyone has been on this island before? Probably yes. You should never think you have done something for the first time in Spitsbergen, someone has almost always been there before. There is already an even younger island close to the glacier, which was in 2015 still covered with a tower of isolated glacier ice. And more rocks are coming out under the ice.